This is a stunning effect and an audience favourite! 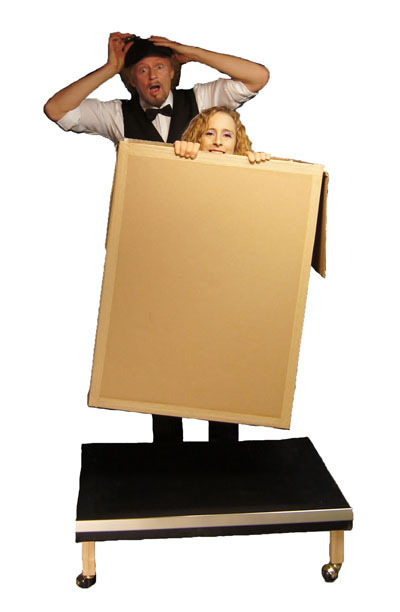 A true marvel, the Floating Box is an astonishing way to introduce your assistant. A card board box rests on a platform. At the command of the magician the box begins to move around and float without being touched. The box appears to be lighter than air. Suddenly a beautiful woman pops out of the box and the box continues to float. This illusion can easily be themed with a company logo or for events like Christmas. Portable, uses an everyday object, ideal for different stage settings and truly stuns the audience. A rarely seen effect in modern times! 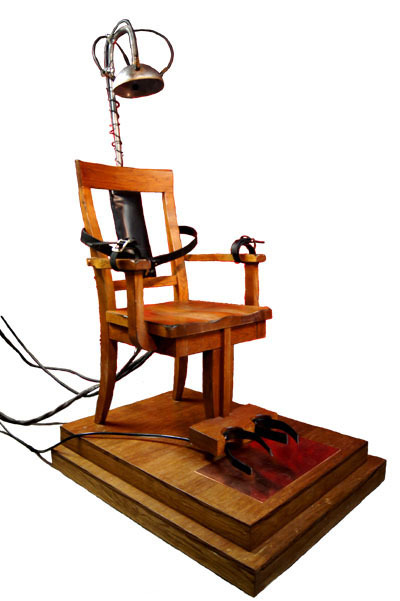 This Electric Chair is perfect for stage or sideshow. A specially made chair is wired to an instrument panel that is plugged into a regular electrical outlet. A girl sits on the chair and thousands of volts of electricity runs through her body. When the control panel is turned on she is capable of lighting fluorescent and neon lights with touch alone. She can even light a torch with the spark from her hand or tongue! This is a stunning illusion. 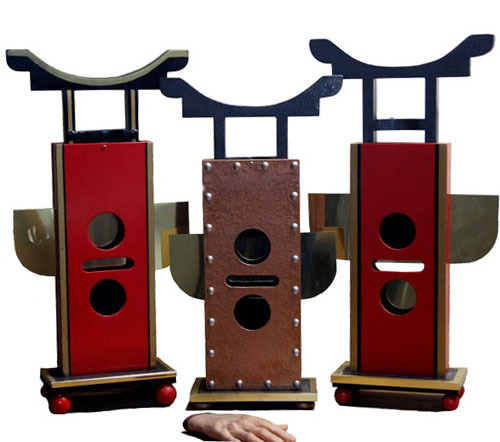 A girl is placed inside a stack of boxes and divided into four pieces by 6 metal blades. The four boxes are shuffled and restacked on the base. Upon opening the doors the performer realizes that the girl has been assembled incorrectly! The act can end there or the girl can be restored to the correct order! 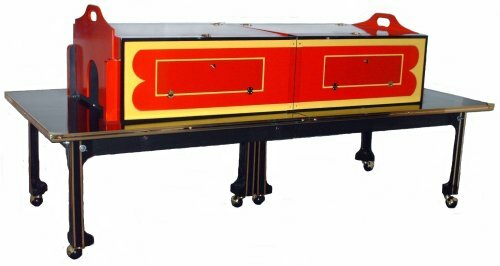 The Buzz Saw is one of the most sensational illusions to ever be created but it has seldom been seen by modern audiences. The assistant lays on the table and the performer flips the switch to start the Saw. It begins to spin and it is pushed through the girl in full view of the audience. When the sawing is complete the assistant is shown to be fully restored. For an additional picture please click here. To view video of this illusion please click here. A very spectacular but challenging illusion to perform. The performer is suspended on the tip of a sword. 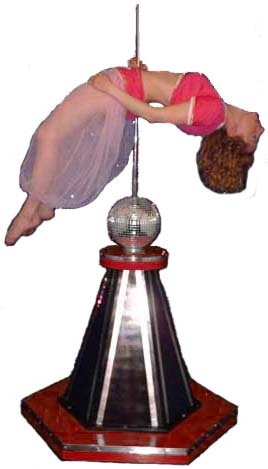 The performer is slowly revovled 360 degrees and then suddenly drops down onto the blade; seemingly impaled. This illusion can be done surrounded. Spectacular magic at its finest! This classic effect never fails to entertain. The performer introduces the head chopper by slicing a head of lettuce in half. A volunteer's head is then locked in the chopper and vegetables are placed in the holes beside the head and two carrots are placed in the holes below. The blade seems to magically pass through the volunteers head while still cutting all the vegetables. This Doll House is one of the most spectacular on the market today! On the stage sits a beautiful Doll House elevated on a thin table. The two front doors are open to show the tiny house empty. The doors are shut and the unit is revolved to show all four sides. At the magicians command, the roof of the house falls away as your lovely assistant magically appears. Swords are available for this illusion for an additional charge. Please inquire. Still a crowd pleaser this Zig Zag is based on the classic Robert Harbin illusion. Manufactured from the finest birch, heavy casters and stainless steel blades this illusion stands 66" tall, 24" across and 19" deep. Various color combinations available. Truly one of the classic illusions of magic! 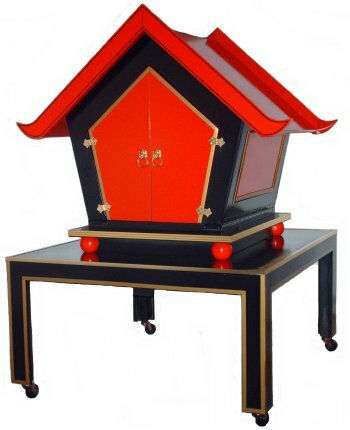 Your assistant is locked into a slender box that sits on a table with her head and feet secured by stocks. The box and the table are sawn in half and two stainless steel blades are inserted to separate the halves of the assistants body. The boxes are then pulled apart and the front doors opened to show the upper and lower portions of the body. The boxes are reconnected and the assistant is released unharmed. Various paint colors are available. Please inquire. 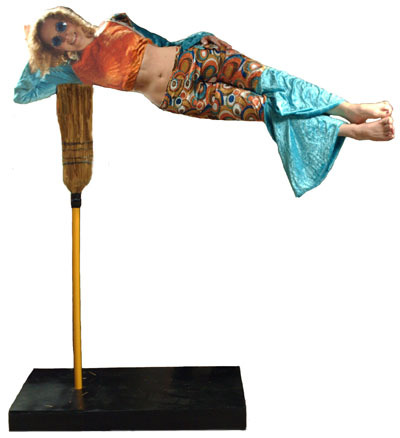 What could be more magical than your assistant floating on the bristles of a broom? 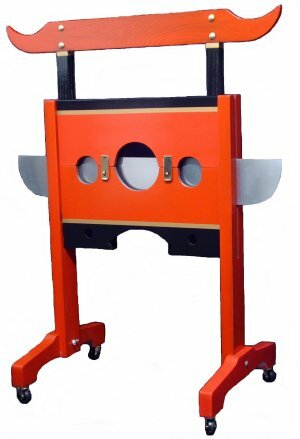 Your assistant steps onto a small stool that is set on a small platform. Two brooms are placed upright, one beneath each arm. The magician hypnotizes the assistant and the stool is removed. One broom is removed and the assistants body is raised horizontally and remains in the horizontal position. Also available as a microphone stand. The magician displays several trays of costumes. The trays are stacked, one upon the other, into the trunk. The trunk lid is closed and the audience is asked to pick a costume. The lid of the trunk is immediately opened and up pops a young lady, fully dressed in the selected costume. All other costumes have vanished. This is a classic illusion that is seldom seen today. A stunningly beautiful prop. One would be hard pressed to find an illusion as beautifully built and finished as this Egyptian Head Box. Assistant or volunteer inserts head in empty box. The front doors are closed and 15 swords are placed in the box much to the disbelief of the audience. The front doors are opened and the head has vanished! The doors are closed, the swords removed and the doors opened to reveal that the head has reappeared. 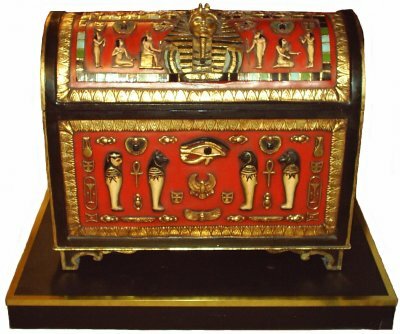 Hand Crafted out of high quality birch this head box has be meticulously finished with an Egyptian motif. Other motifs and color schemes are available. 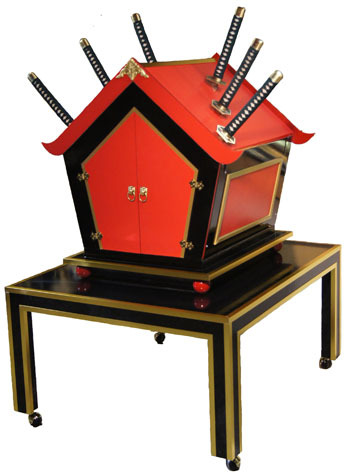 This illusion comes with 15 swords and stands approximately 3 ½ feet high. With the ability to fold the entire illusion flat, transporting has never been easier. The approximate weight of the head box and stand is 45 lbs. 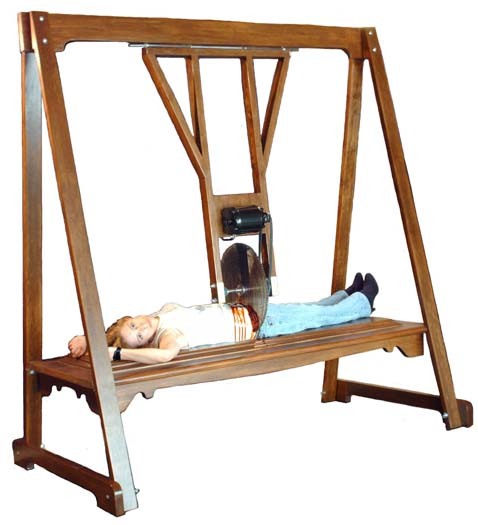 This guillotine is not to be confused with other models available. This is a showstopper that stands almost 7' tall and weights 45 lbs! This authentic looking guillotine is handcrafted out of solid hardwoods and softwoods using only high quality brass hardware and polished stainless steel blades. Richard's own additions to this classic illusion include two pins in place to ensure that the blades do not fall prematurely, two carrot holes on the top and bottom stock to create the illusion of the blade cutting through the victim's neck and having the ability to remove the feet for transporting purposes. 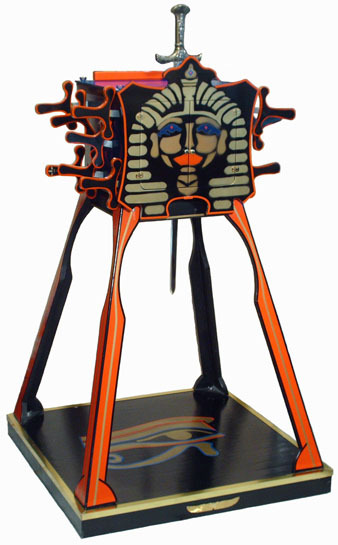 This illusion is entirely Richard's own design and was originally designed in 1987. The handle is made of solid oak with a brass blade. The body of the illusion is made of the finest birch. A carrot can be placed within the hand slot and cut in half to demonstrate the sharpness of the blade. A victim's hand is placed within the slot and the blade is thrust down. The solid blade visibly penetrates the victim's hand to the disbelief of the audience. The hand is seen in the center of the solid blade. The mechanics of this illusion are unlike any other hand chopper on the market. A perfect addition for the platform and stage performer! Various color combinations are available. A must have for every close-up performer! * An audience member selects and even signs a card from a borrowed deck. The performer shuffles and cuts the cards. 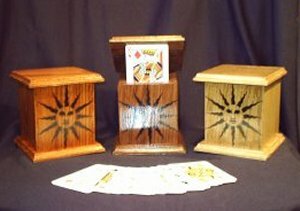 Showing the audience the Rising Card Box all around you drop the cards into the box and close the lid. Standing away from all your surroundings and holding the box in one hand the lid of the box slowly begins to open. As the lid opens the audience members' selected card is seen magically rising from the deck. 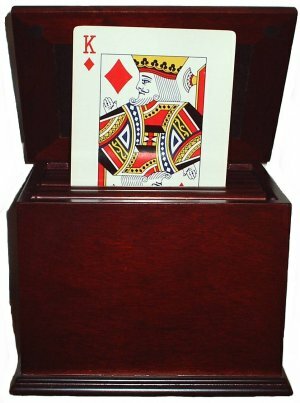 Constructed of the finest hardwood and exquisitely finished, this Rising Card Box is the perfect addition to any show! With no magnets, threads, pulleys, rubber bands, hydraulics or reels the effect is mesmerizing up close or on stage. *Also available in stage size. A Richard Sherry original created in 1982. 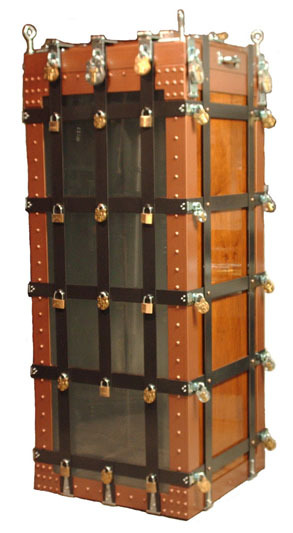 This clear trunk can be used as a sole escape, as a substitution or in conjunction with the Wooden Sub Trunk! 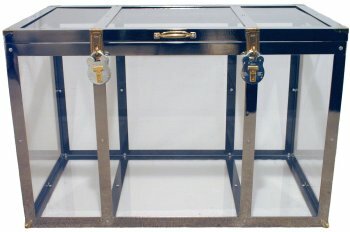 The 3/8" Plexiglas and welded frame make this illusion very strong and very light weight. 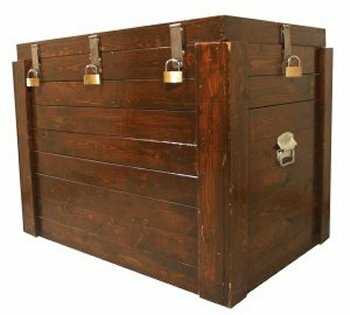 This trunk if made based on individual body measurements provided at time of order. 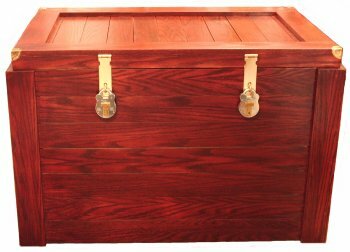 This trunk can also be filled with water for an even more exciting escape. Measuring 53" high by 20" wide and constructed of solid oak, this is a classic illusion. The apparatus can be thoroughly examined and the escape method will remain undetectable. Packing easily this is a great addition to any small or medium show. This can also be used as a great substitution effect. Various stain colors are available. This unique illusion is seldom seen today. With vibrant coloring the illusion creates excitement in the audience. A head of lettuce is cut to show the sharpness of the blade. An audience member's head is placed in the "mouth" with a carrot in each ear of the chopper. The blade comes crashing down cutting the carrots and leaving the volunteers head intact. 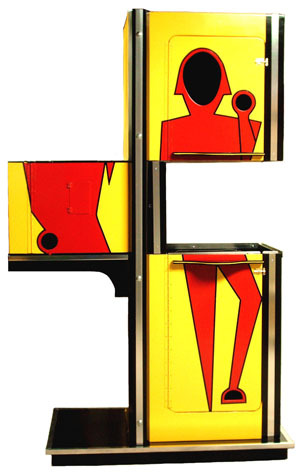 This illusion stands 56" high and 22" wide. With a brass blade and made of birch and oak, this unit folds in half for easy transport.